What are the best trekking or backpacking boots for long-term travel? 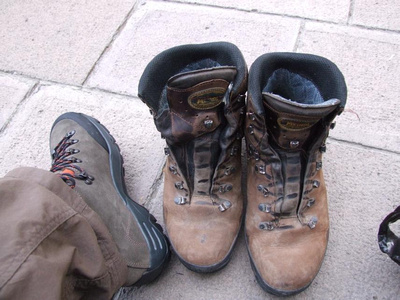 8 years & 6 boots: What are the best backpacking boots for long-term travel? by Dave from The Longest Way Home ~ October 29th, 2012. Updated on April 20th, 2014. Published in: Travel blog » Long-term travel. 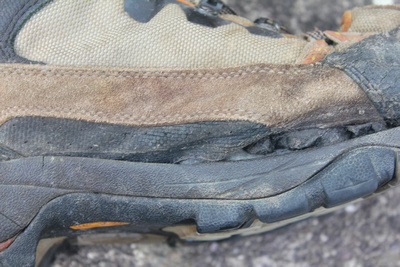 Can any backpacking boot survive a long time before this happens? If you were following my tweets last week you’ll know that for about the 6th time in 8 years yet another pair of my backpacking boots fell apart. I’d love to say it was due to a fault in the stitching or something similar. Quite honestly they just weren’t up to the job. They simply disintegrated. What’s the best boot for long-term travel? The ones you feel most comfortable in. That’s the honest answer. Forget ultra-neo-contour-memory-foam and Gortex-breathable-waterproof-antibacterial linings. If the shoe or boot doesn’t fit well then it will all be as worthless to you as you either slip and slide to blister misery or get your toes reshaped due to a size too small. I’m utterly baffled by the sales assistants around the world who babble off brand names and technical shoe jargon whenever I go looking for new boots. I just want to know if they’ll last longer than the last pair of Inferno-ice-breaking-insert-cool-sounding-name boots I bought the year before that are now falling apart in front of us. “I’m really surprised to hear that!” is the usual reply I get. I’ve heard this line about … ohhh … four times now. After this the staff are stumped. I’m guessing because they’ve actually never been too far. Not their fault. But hey … trekking/backpacking boot’s are not cheap and it would be nice if there was some decent info out there rather than fancy sounding names. Trekking / Backpacking boot’s or shoes for long-term travel? For the record: I like boots over shoes. Always have, always will. I don’t wear the tall lace ups. I wear boots to just above the ankle. I like the physical protection it gives for rampant rickshaws, bicycles, city dogs, jungle insects, mud splashes, public toilets and everything else in between. Including terrifying the life out of rubber sandal wearing nations when boarding public transport and people don’t keep their feet in! 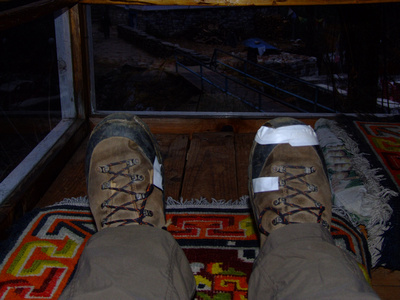 Boots are also a lot easier to repair in emergencies than shoes (Turkey/Iran – Everest Trek). Okay so the basketball boots, leather custom and the First North Face boots don’t really count as one was just a quick fix, the other was a chance and the last can come down to a bad pair. That said I’ve owned about 2 other pairs of cheaper basketball boot when staying a place for a while too. So it’s about 10 in total. But 6 pairs that did not survive as long as they should have. The biggest problem is actually finding a good store with a good range! In West Europe no problems though many stores only stock one or two ranges so you have to jump between stores. Turkey so / so. Iran … quite good actually, at least in Shiraz where I spotted a great store. After that in Asia it’s been nothing but light-weight trendy good-looking trekking fodder. In South East Asia it was mainly canvas backpacking boots with more trendy designs, rubber slashes, weight under 200 grams and glow in the dark logos than anything truly tough. Worse yet for the long-term traveler is when you buy a pair when on the move it’s not like you can just hop back to the store and get a replacement. You’ve probably moved 1-4 countries by the time a new pair have broken apart. And, there’s really nothing you can do about it as you are unlikely to be caring a spare pair around. My first wallet crushing Meindls broke after 6 months some 5 years ago. 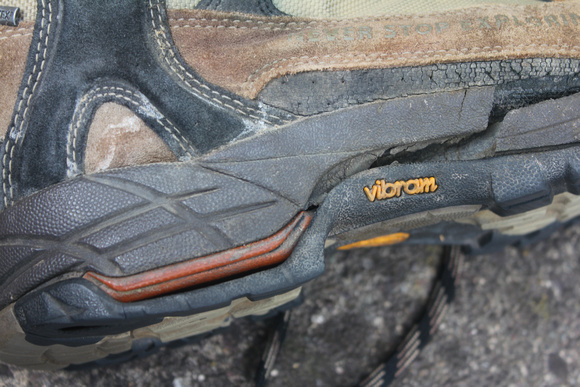 The Vibram soles cracked in the middle. Both of them. Spotted with glee by a man in Goreme Turkey. Sadly Turkey is not so great in finding great trekking boots. Better than Iran I thought. So when in Ankara I bought a pair of Technica Italian boots. I didn’t like them as they looked like … well trendy new trekking boots. And I didn’t really want a shiny new pair of boots when going overland into Iran at the time. I did contact Meindl at the time to tell them about all this re the warranty. It took ohhh one week to get a reply. I was to pack them up, with the receipt and ship them off to Meindl HQ where they’d be accessed and if proven faulty shipped back to me in about 3-4 weeks. I explained I was just going into Iran and didn’t have 3 weeks to wait around due to the visa. I was told that this was the policy and worse yet they’d only ship the boots back to where I’d sent them from i.e Turkey. So with great pride of pleasure I rammed the boots into a bin outside the Afghanistan Embassy in Ankara as I claimed my India visa nearby and hobbled off in my blister ensuing new boots. Meanwhile my binned boots were rescued by a not so well to do man who was not too happy to discover his were better than my 6 month old ones. Sufficed to say the Technica boots lasted longer than any other backpacking boot I’ve owned. Heck, they made it to Everest Base Camp through snow and ice while being held together by electrical tape. Again, when on the road forget having a selection of Berghaus, Brasher, Columbia, Jack Wolfskin, Mammout, Meindl, Merrell, Salomon, Technica, The North Face or whoever. Chances are you’ll only ever get a limited selection when you need them the most. Last weeks selection for me was as follows. Mammut, Meindl and The North Face. I really don’t like canvas and it’s coming into winter so wanted something heavy and leather. That left Mammut and Meindl. I really wanted the Mammut to work. Big, black, heavy and will crush anything in their path vs big, brown, heavy and will crush anything in their path …. but would they break in six months like before? The Mammut were too big in the heel by about two millimeters. 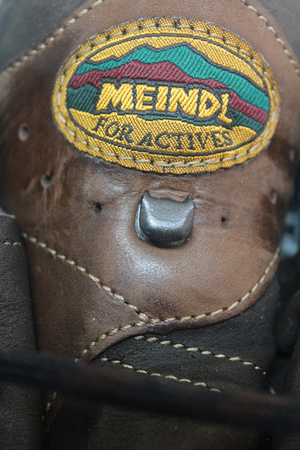 The Meindl fit perfectly. Yes, I really wanted the Mammut to work out. But I knew in my heart I’d regret the heel slippage within a week. So I am giving Meindl a second chance. But, by gosh if they break in under a year I’m getting on a flight to Germany and will make headlines by inserting their remnants into the Meindl CEO’s personal boot holder of a rear passage – and in this day of taking everything so literally take that with a grain of salt – But Herr/ Frau Meindl, I will be on a plane and making a very public visit to your office should they break, again. So what are the best backpacking boots for long-term travel? Forget the people who say they’ve been wearing brand X for 3 years and they’ve been brilliant. They aren’t wearing them 24/7/365 or simply are walking on meadows of pansies or have the feet of blessed angels. The longest lasting boots I’ve owned were an unbranded pair of leather boots followed by Technica. My best advice is to simply find a pair that feel just right for you and wear really good quality trekking socks. I still have two pairs that are 8 years old with no worn out patches! And if you want to be ultra smart try out a pair of SuperFeet insoles. Lastly be sure to break in (wear) your new boots for several weeks/months before going traveling with them. After that, I think the real secret to long-lasting backpacking boots for long-term travel is … luck. Planning on booking a hotel room? I recommend you try my own hotel search network here. The best rates guaranteed! A simple pair of Colombia here for long weekends and so on. Not sure if they would last a long time. But I’m happy with them. So long as they meet your needs Anna! Unless I get a super good price on a pair of giga-modern waterproof, Goretex boots, I usually go for a basic, all leather upper variety that has a sewn on, easy to replace, generic issue sole (not the type with all kinds of curves and a specializations). I’ve never had a difficult time getting the soles replaced (as they are the same type that go on boots just about everywhere) — even way off the beaten track — and this fact has saved me numerous times. Unfortunately, this type of boot is becoming hard to find in the USA or developed countries. Shooting for work boots rather than hiking boots (or getting them in countries with a reputation for leather working, like Mexico) has always been my best bet. Yea the longest lasting pair I ever had were the leather ones I mentioned. Only issue I had with them was the skin abrasion for trekking. The leather uppers were fine, but couldn’t find a shoe repair person who’d replace the soles in the end. Told me to go out an buy a new pair. But similar to what you wrote, they didn’t make them anymore. It doesn’t surprise me that they don’t last more than a year or two (the better ones) given that you wear them every single day. But 6 months and the sole cracks? That’s inexcusable. Do you have a 2nd pear of shoes you can wear when not trekking? Nope, too much weight to carry a second pair. Rubber sandals for the shower and that’s it. So I need pair that survive. LoL it seems that there is no magic bullet! I also love boots but I preserve mine by only using them when I go hiking. I bought my last pair two years ago to visit Tibet and so far they are doing well. They are an anonymous pair of Chinese boots but they are warm, water proof and quite comfortable. I do agree that socks are a good part of the equation too. Especially when you do a lot of hiking. Any insight on good sock brands? I would love to hear you opinion! Cheers for the info Furio. Nameless brands are what I’ll be trying if these Meindl break on me. It’s not worth it to be stuck out somewhere with nothing! Have to agree with Wade. I’ve always used black leather boots. In the early days it was Doc Martens and then others. But since 2006, I’ve had my brilliant Diesel (high-lace up with steel caps) boots. They are light, too. Only issue is getting new rubber tacked onto worn heels – done in China, korea, and Iran, with no problems. Whatsmore they’re mega-comfortable (with extra inner-soles) and look cool, too. So I use them nearly-24/7 as an ESL teacher, for night-life, hiking, and most general travel. It also saves on pack space and weigh – as I only travel ever have 2 pairs of footwear with me: just boots and sandals. I was tempted by Catapillar last year but they only had the yellow suede one’s which seemed to stain easily. No dark pair so I was stuck. But yes, I’ll go back to leather boots if these one’s go on me. Couldn’t handle steel toe caps though. Had a pair before and they dug in too much. Same as you though, one pair of boots and sandals for the shower. The style is more like high combat or biker boots but simple and light. Unfortunately this model may longer be made … SO I really dread the day that I face the great boot buying challenge, again. Interesting read. I don’t use a pair of shoes or boots everyday, but I can imagine that no brand exists that can withstand your use on different terrain, some very demanding, for more than a year. But within 6 months? That’s poor. These “big brands” have sacrificed quality by having their products made in places like China to keep cost down but keep their prices high. I have to agree with the big brands sacrificing quality over quantity to sell more boots to newbies. I’m done with brands if these break again. Proof is on my feet in that case – they don’t last. Anyhoo…my experience – I use trekking shoes, not boots. 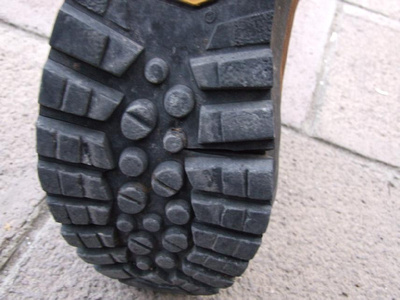 2010, I walked many miles (urban and hiking), almost every single day, for 6 months,in a pair of Nike gortex trekking shoes, and they lasted beyond this time. Then, I used them for a few shorter treks in 2011, and recently another couple of months in 2012. But the sole wore out, and wasn’t replaceable, so I binned them. The uppers were perfect after all this time, it was such a waste. So, I went Nike again – but this time, after 2 months of walking/hiking, I can see the soles wearing out really fast. I think I’ll be lucky to get another month out of them. …they are still in perfect condition, with the only fault – it looks like a lace is about to snap. Just my experience, to help people decide. If these Meindl break I’m done with branded backpacking boots. They are very comfortable but I need durability and they just don’t match up to what I require. Which for the last calendar year was just everyday use. Hence by “Pavement” note! After that, I’m onto non-branded pairs. Thanks for your insight though! Always good to get a round up of everyone’s experience with these things. Hi,Dave! Whenever you mention trekking boots,I can’t help thinking of my Father that owned a sport shop since 1964 to 1989,and all the mythical brands that passed trhough our hands-yes,by the time children were supposed to give a hand after studying-Technica,Dolomite,San Marco,and my best liked,La Scarpa by La Scarpa,all from Montebelluna(Treviso).They were all leather,black or dark brown,and the pre-Vibram sole was called “carro armato”(caterpillar).Also they had ski boots; after back to the Hotel,we had to carefully grease them with a kind of animal fat ,very stinky.Pre-Goretex,too. You are the second person to recommend Caterpillar so far. If these current boots don’t last I’m seriously considering a pair of them. At the moment still breaking them is so ouch! My brother says Salomon,and that “almost go alone”,a bit exaggerate,maybe,but,now that you made me focus on the subject,every time I visit him-does live in the countryside-they have a very “lived”look. You simply don’t get practical well written information like this anywhere else. The boot companies of the world should be paying attention. Then again, maybe they like their product falling apart every year! Yes Jan maybe they like the repeat sales. Then again perhaps not everyone wears the same boot all year round. But thanks for the advice. other than my salomons i have crocs…. when its super hot and humid my feet slide a bit too much and when its rainy u feet get pretty dirty quickly…. hate walking boots actually.. prefer bear feet!!! my salamons… i have run mountain marathons in them, road half marathons.. trekked in taman negara and to ABC…. great in the snow as long as one keeps moving…. dry quickly…. and never had an issue with them…. they are the only thing i have ever owned that do their job well…. everything else is shite!!!!! Yea nothing is lasting these days. Getting a bit tired of it too. Electronics, gear, everything seems to have a lifespan of about 18 months. So much for brand loyalty! I’ll go non-branded next time. Where are you buying your boots? Are you buying legit branded pairs? I can say that my last pair lasted 4 years. I didn’t wear then 24/7/365 (don’t sleep in boots), but I put thousands of km on them, and a handful of 3000m+ peaks. When they finally fell apart, I bought the exact same pair again. Trekking is my hobby and I would also wear boots rather than shoes. Thanks for your tips Dave! Thanks for sharing this wonderful post. You tried so many different boots for backpacking, why don’t you tried the Caterpillar shoes as they considered as one the best for trekking and the other brand is Woodland. I advised you try one of those and than share your experience about it.